Mumbai with a last ball victory in the last match and Rajasthan having won both their games comfortably, someone will like to keep up the winning streak. Dravid won the coin and ironically decided to bowl first, having won both the previous games batting first, he could gone for the same, may be he had dew in his mind though. Levi, Suman & Sharma gave a start to set up the blast to continue for the Trinidadian Kieron Pollard, as he went berserk to take on the bowlers, showed no respect what so ever, massacred every one to get to his half century and ended up with 64 from 33 balls. which included 6 fours and 4 sixes. To finish it in style Bhaji joined the party to pick up two more sixes, to finish the innings with 197/6, Highest total of this season. Having to chase a tough score, Rajasthan lost their skipper and first down in the second over, many would have felt it would be a one more one sided contest, but England batsman Owasis Shah turned the heat on, as he also went equally berserk like Pollard, apart from having a class in his stroke, rather than the power which the later has. With Menaria and Shah in the crease, looked Rajasthan are in the chase very much, but its again the slinger Malinga, who got the very important double strike to remove Shah and Botha in the very same over, which changed the game. From then on, Royals tried to close in, by end they fell short of 27 runs of the target. Not bad as anyone expected. Royals can still put up their head for the fight they have put in. – Top three Bowlers in IPL 5 are from the same team Munaf with 10 and followed by Kieron Pollard and Slinger Malinga with 9 each. – 76 runs scored by Owasis Shah is the second best score in this tournament so far, it bettered 73* by Rohit Sharma. – 197/6 is the highest total of this season so far, it went past 193/6 by Chennai. – 367 runs, total match aggregate is the highest for this season, previous was 351 runs between Kings XI Punjab and Rajasthan royals on 6th April. – 96 runs partnership between Pollard and Rayudu is the best partnership for any wicket for this season; it was followed by the second best performance which came later in the day with 82 runs between Owasis Shah and Rahane. Match 66, a very Important one for Mumbai Indians as KXIP knocking their doors very closely after KKR pulling a victory yesterday. Sachin Won the toss and decided to Bat first, As always Warney was very happy ever to play his last outing in IPL as a player in the field. Without doubt they Royals wanted their skipper to walk off with a famous victory, and what they do, bowl like hero’s and field like arrows… Nothing u could ask more, as Mumbai lost their wickets in the regular intervals, and even long standing Rohit Sharma could do much in the end overs, even after scoring his first fifty of the season. 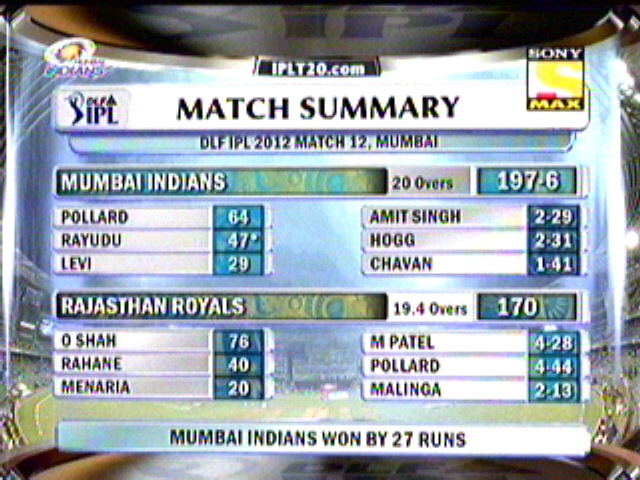 Mumbai Indians finished with 133/5 in 20 overs. Needed a good opening partnership to seal the game, but no one thought that the opening partnership alone will seal the game. Yes it was the case, as Shane Watson was in real mood to give Warnie a warm send off, as he blasted one of the Mumbai’s best bowler of the tournament Malinga over the park 3 times, each one was more majestic than the previous. On the other hand, Dravid played a more sensible knock to knock around and give strike to the tormentor, and that doesn’t mean he let away loose balls, as he punished few of them to fences too.. Overall a first 10 wicket victory for the season. Thanks to Dravid and Watson duo for it. I am not forgetting Shane Warne, who is been a legend in this game, none could have written script for this more befitting farewell for the Hero…. 1. Royal Challengers Bangalore 2. Chennai Super Kings, and 3.Kolkata Knight Riders. – Sachin Tendulkar scored his 200th boundary in IPL history and became the first one to do so. – Rohit Sharma scored the 1700th boundary and Shane Watson scored the 550th Six of the IPL 4. – Both the fifty scorer’s Watson and Rohit Sharma scored their first fifty of this season. – Surprisingly, Rajasthan Royals won all their games (6 of them) in this season by chasing alone. – 134* partnership between Shane Watson & Rahul Dravid is the highest for the season for Rajasthan Royals; previous best was by the same pair against Chennai scoring 86. – 10 wickets victory by Rajasthan Royals is their first ever on in the IPL seasons. – It’s also only the third time a team had won with 10 wickets margin; other two teams are Deccan’s Vs Mumbai and Bangalore Vs Rajasthan. – Rohit Sharma is the last wicket picked up Shane Warne in the IPL history, and its his 57th wicket overall. Match 34, Classic Rivals Sachin takes on Warne on their home ground, Start wasn’t so good for Mumbai as they lost Sachin very early to Ashok Menaria, Royals bowled very tight lines and gave nothing to score runs as they came in singles mostly, As every1 tried to accelerate they went back to pavilion, which meant 17 runs from Symonds was the highest score of Mumbai’s heavy batting line up, Which really meant Mumbai finally settled for the lowest ever IPL score 94/8 in 20 overs. Chase was so simple as Watson and Botha completed the formalities to chase down 95 runs with 7 wickets and 11 balls to spare. Match 35, From Jaipur to Bangalore, Another skipper won the toss and decided to bowl first, Warne was right to make the decision as his bowlers restricted Mumbai to a total which is the lowest of all times for them, but it wasn’t the same for PWI Skipper Yuvi as they were scattered all over by Kohli and Gayle, esp the latter played an excellent knock, he pulled, drove, and punished the Pune’s bowler. RCB ended their innings at 181/5 in 20 overs. PWI began their chase nervously but couldn’t hold on for long, as Ryder went after a well played fifty, Yuvi and Uthappa tried to come closer, but didn’t help much them to save them from heading to a straight 5th defeat in their opening season of IPL. RCB won the game by 26 runs comfortably. – Ashok Menaria’s picked up his maiden wicket in IPL and who else do u think, Yes it’s Sachin Tendulkar. – Kieron Pollard scored his first runs of IPL 4, it’s 4th innings he is playing in IPL. 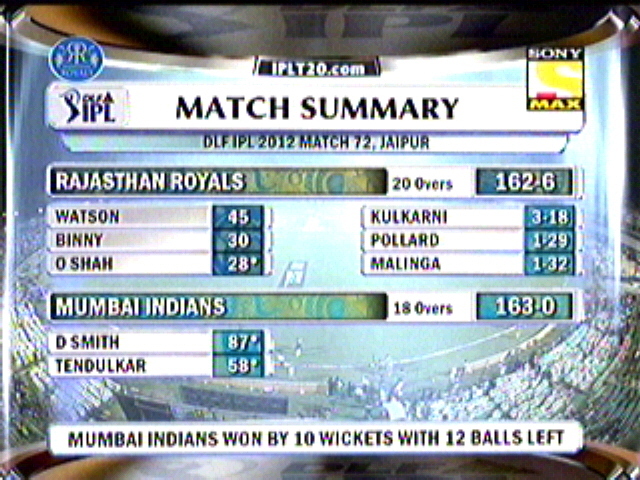 – 11 out of 14 games won by Rajasthan Royals in their home ground in Jaipur. 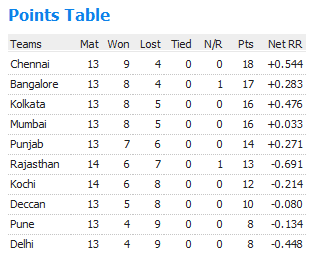 – 57/0 is the best powerplay score by RCB in this season, previous was also the same against KKR. – 94/8 is the lowest IPL score by Mumbai Indians, previous lowest was 116/9 against KXIP in 2008. – AB de Villers scored a six which went long way but not long enough to beat 106 meters by David Hussey, it missed by 3 meters as it went for only 103 meters. – Virat Kohli scored the 900th Boundary and Yuvraj Singh scored the 300th Six in IPL 4. – Jesse Ryder scored his 2nd IPL fifty. 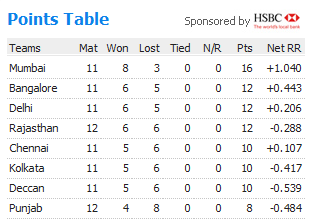 – PWI is the second team in this season to have lost five games in a trot, first one was Delhi Daredevils. – Munaf Patel bowled the 13th Maiden of IPL 4. Kings XI wouldn’t mind pulling another upsetter here today, on the othre side, Gambhir dont want to leave the things to the end… As he won the toss and decided to Bat first in Kotla track. (Avg score here is 190). Shewag walked out with Warner to start the things, To correct myself, Nothing started as Shewag gone in the very first ball he faced, Skipper came in place of him, he did play a fine innings with boundaries flowing from his bat, All of a sudden came the twist or the bad luck for Delhi, as two of the Delhi Batsmen ran themselves out in space of 3 balls. From then on, no looking back as KXIP tied knots so tight and runs dried up and nothing went in the way for Delhi, As One after the Other Walked back to Pavilion, Excellent Bowling from KXIP shud say, as Spinners spinned the web and casted them. Karthik played a Placid innings scoring 17 from 35 balls. Late play from Mithun Manhas got past them to three figures. As Delhi failed to complete their 20 overs quota aggregated Nelson score. 111 in 19.4 overs. DD 111/10 in 19.4 overs. KXIP 112/3 in 18.4 overs. KXIP WON THE MATCH BY 7 WICKETS. Mumbai got back Veteran Jayasuriya back in the squad, he opened with Sachin, but Jayasuriya failed to impress as he was caught just for 1, soon Rayudu followed back Pavilion in the same over, Watson being the double striker. Tiwary played few shots down the ground, before he too perished to a shorter delivery from Watson, Responsibility came in the shoulders of Sachin and Duminy to rescue the team, They both stood together to do the job, Both did bat out the middle overs brilliantly and gathered run in decent pace.Duminy was out in the 13th over, when he mistimed a pull of trivedi. Pollard played a cameo but the real Star of the Mumbai is Sachin without doubt, from over 1 to over 20 he hold the game together and gave the momentum it needed, After 20 overs he remained unbeaten on 89, overtaking Kallis for the Orange cap. Bowling except Shane watson none look to build on the early road opened, Even Warne failed to create magic. MI 174/5 in 20 overs. RR 137/8 in 20 overs. MI WON THE MATCH BY 37 RUNS. Chasing 175 runs, Royals got off to a worst possible start losing 3 of their best batsmen back to pavilion in no time, Two good deliveries and one bad call costed Rajasthan dearly, Shane watson paid the price for the bad call from Fazal, After some time, Fazal paid for his fault, as he was ran out by Abshiek, and it continued to him too… 3 run out in a row hurt Royals down, finally their only hope Yusuf came in, he started off with a six of Pollard, but the very next ball, Mumbai closed the match as he was caught in close fine leg Harbhajan easily. Not to blame any one from here, just batted to reduced the trailing runs, Dole tried to compensate for his missed catch of Sachin, but its all late, as Mumbai roared the match by 37 runs and became the first team to enter into the semis of this season. I will certainly say, Sachin as a lone man taken Mumbai to the semi’s…Rajasthan could have fancied their chances better if Aditya Dole holded on to a catch offered by Sachin in 45. – There is a Period where 46 balls went without boundary today for DD, which is highest ever for them. 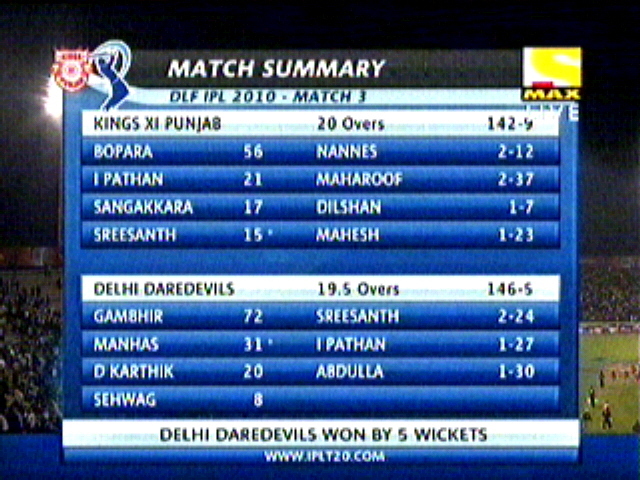 – Delhi’s innings was the first one to end without even a single six. – Side batting second has always won the game between KXIP and DD. – Its 5th time Gambhir is been run out in this tournament and 3rd consecutive. took back the Orange Cap from Kallis. – Everytime Tendulkar scored fifty, Mumbai Indians won the game. 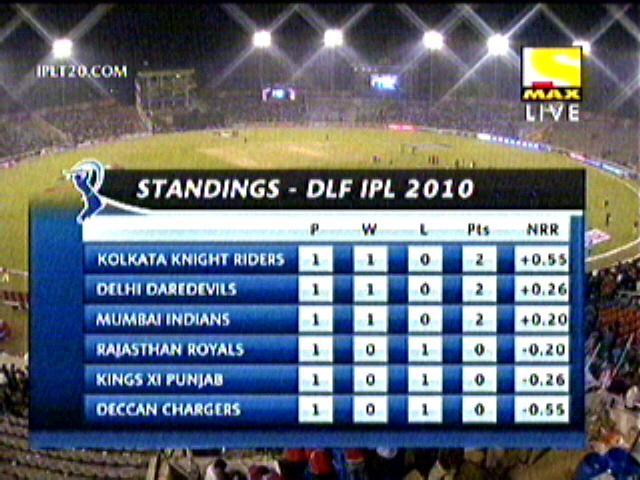 – Mumbai Indians became the first team to qualify for the Semi finals of this season. 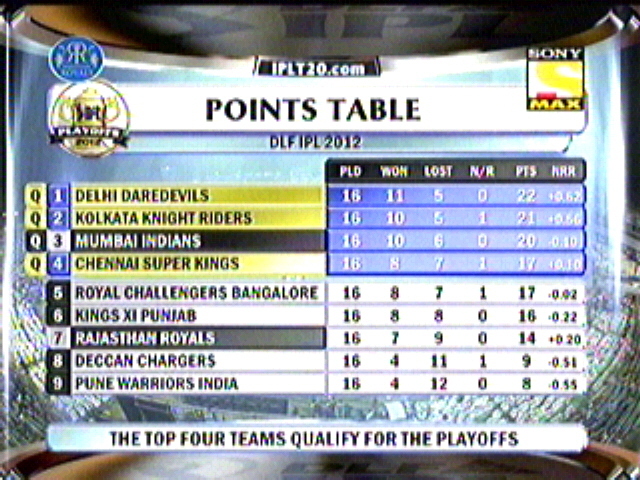 other team yet to reach semis in IPL, it is Sharukh’s KKR. – Zaheer bowled the third Maiden of this season. – Rajasthan Royals lost their first game in their home ground. score of Kallis, who is the close rival for Orange Cap. Orange Cap – Sachin Tendulkar (512) followed by J.Kallis (501) and S.Ganguly(366). Purple Cap – Pragyan Ojha(16) followed by Amit Mishra(15) and Vinay Kumar(14). Most Sixes – Yusuf Pathan (24) followed by Robin Uthappa (22). Most Fours – Sachin Tendulkar(71) followed by J.Kallis (61). Last year this team placed themselves at 7th, just bettered wooden spooners KKR, But i shud say they did perform much than it really seems… Yes i am Talking abt Mumbai Indians… May be Ambani’s didnt want the same to happen in the years to come, which cleared showed their intentions in getting Kieron Pollard, even they are ready to go Bankrupt for this hard hitting all rounder…. okay Tats all history now, Today is the day where IPl 3 unveils for Mumbaikar Sachin against his old enemy Shane warne’s royals..
Kings XI have their new Skipper Sangakarra, replacing local boy Yuvraj, as well Delhi have their new skipper Gambhir coming in place his co partner Shewag. So both the new captain went out for toss and after a small confusion on Head and Tails in the coin, Gambhir won the toss and decided to Field first… And his bowlers, did oblige to his decision picking 4 quick wickets in quick succession, leaving KXIP trailing 44/4 in 6 overs. Later its Pathan and Bopara who paced a placid innings and got the run rate slowly up close to 8, but once Pathan departed, they wickets tumbled and in the end, few funny shot selections by tail enders (esp Sreesanth)entertained all, and reached a score of 142 losing 9 wickets. Just Like the same Punjab innings, Delhi too had a worst start, losing both the openers in the second over itself, sreesanth being the star bowler picking both. Gambhir joined ab devillers for a short while of 35 runs, later joined Dinesh karthik for another 34 run partnership, But the Main partnership came between Skipper Gambhir and Mithun Manhas at the important time, they bith rotated the strike slowly, and took necessary risk at times, to gather a partnership of 61 runs, which virtually took the game out of punjab’s hand… U can really appreciate Punjab to make a game out of a very very moderate total, but u have to blame them, for not taking many chances given by delhi, i guess, nearly half a dozen chances are spilled out, in the form of run outs and catches. Nevertheless Sangakarra tried to pull the rabbit out the hat, But in the end, Delhi Skipper had his answer for it… Delhi went back smiling taking their first win of the season 3. – Yususf Pathan Scored the Fastest and his Maiden century in IPL… (100 in 37 balls), It is also the first century for Rajsthan Royals. – 212 scored by Mumbai Indians is theri best IPL total, bettering previous best 202 vs chennai, in 2008. – This is the first time a IpL century goes in Vain, without winning the game for the team. – Y.Pathan leads for Orange cap as of now, with 100 runs. Yusuf tops with 778 runs and smith follows with 679. – Gambhir scored his highest score (72) as Captain, his IPl best being 86. – Gambhir also scored his 7th IPL fifty. – Ironically, Delhi Notched up, just their 2nd win against KXIP, out of 5 games played (40%). 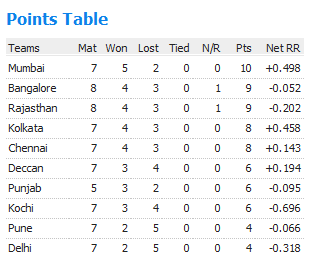 Which is the lowest against any IPL team by Delhi. If u have blinked the eyes u have missed an exciting action of cricket. Yep, its another day where both the games went down to the wire. Chennai would love to win their sixth game in a row, but it much more important for Jumbo’s men to see themselves in semi finals. Dhoni won the toss and decided to bat first, to a big surprise Kumble himself bowled the first over and gave away just 4 in it. But in the next over hayden went on to take vinay kumar for 3 boundaries and proved why he is still wearing the orange cap. Vijay departed early without making much, (guess he ll be out of squad for next match) then raina had an another short stay of 13 to his name. Dhoni and hayden stayed down till the break time with score is 72/2 in 10 overs. Back from break hayden looked so aggressive and completed yet another half century. as dhoni departed, hayden followed him, when score was 101 and its just 13 overs. But after this every one would have lost faith on the Chennai’s hopeless middle order batting, not even to the mark of 6 runs an over. which in the end resulted just the total of 129 in 19.4 overs. (which means they scored 28 runs in 40 balls and lost 6 wickets after hayden departed). To tell abt bowling, excellent comeback, Kumble sud be very much happy to Marshall his boys well in right time to put back Chennai to a paltry score of 129. 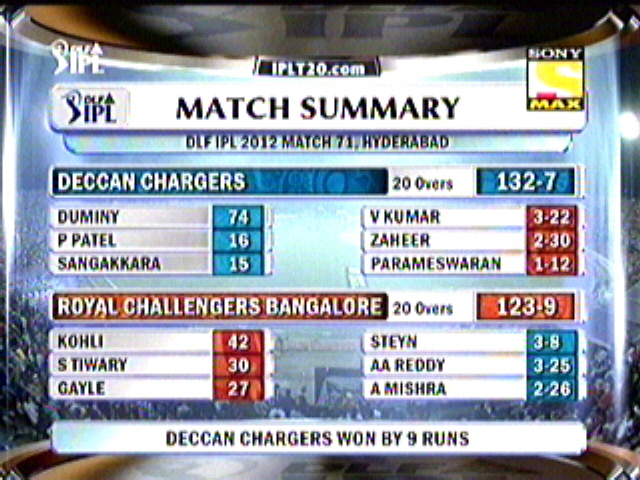 And another point to note, no catches were dropped by RCB and their fielding also looked so good. Chasing a low score of 130, RCB had a terrible start losing to key players in the top, Kallis and Dravid for 0 and 8 respectively. Uthappa too didn’t stay much longer. But its the man in form Ross taylor and Virat kohli joined hands together for RCB, they found boundaries when they were needed and kept the run rate in control all the time. Kohli gave a chance to Hayden which he misjudged completely (shud say he missed the match) tat time he was just 16. later he went on to score 38 before caught in deep midwicket by oram. RCB wouldn’t have struggled a lot, if not Dhoni is captain. Yep a spl note for the brilliant captaincy by Dhoni, who really made a match out of no where, he marshaled his troops well and made RCB always thinking. he even had 3 close in fielder(slip, silly point and leg slip) for Boucher while murali is bowling in a T20 game. Hats off to his efforts and he is a gr8 asset for india no doubt in it. In the end, Kumar’s made the RCB to take beyond the target safely with 2 wickets and balls to spare. Bowling, Morkel looked effective in the top, later on murali and balaji did the best they can, but it all too much to blame with a par less score. Good show by RCB and Good game in the end…. Both teams with 11 points, who ever wins, take themselves closer to semi’s berth. A cracker of a game is on. Shane won the toss and decided to Bat first and opening partnership came good for Rajasthan, Smith amd quiney came good when it mattered. Smith departed after the power play was over. Quiney and pathan got together and kept milking for singles and few boundaries here and there. Mumbai got the important breakthrough when they had Yusuf for 17 just before the strategic break, which really got them back on the game. Later on Jadeja joined the show with Rob and took a partnership of 50 which really the turning point of the game. But after Rob departed, again a batting collapse and credit to mumbai bowlers to restrict Rajasthan just to 145, where they looked to get 160 in ease. Bowling, Jayasuriya got 2 but thats a gamble on 20th over. Neither sorry figures nor the gr8 figures. good display for a T20 game. Taget set was 146, with a new batting line up, Mumbai was straight away into trouble, losing 3 quick wickets which really gave the momentum shift to rajasthan. Both sanath and sachin left out their natural game and tried to pull the game back back from the slump situation, so they weren’t fluent and didn’t take nay kind of risk, which means runs dried up with just singles. Believe it or not, Two Destructive batsmen in the world Sachin and Sanath batted together for 43 deliveries without even a single boundary. after Sanath gone, sachin pulled out few classic shots to bring mumbai back , but Warne had different plans and he took the master by the spin and seems tats the end, but Abshiek provided a 99.5% victory for Mumbai, with his cracking knock of 35, when he was out, Mumbai needed just 6 from 8 balls with 3 wickets in hand. it went to last over, with needing 4 to win, Munaf bowled a over of his life, he took Kulkarni with an excellent yorker to sen him back LBW, then its Mumbai who left out to hold the nerve’s and two more run outs to put the screens for Mumbai and almost an exit screen for Semi’s hope. Bowling, Man its Shane all over again, picked up three important wickets in the right time and his cool head captaincy which got the victory for his team. Whom do u blame Captain, or Coach , Reckless change in the batting order, just trying to strengthen the middle order, they kept sanath and sachin for 4 and 5, which really back fired. – Sudeep Tyagi was the fourth batsmen to be out without even facing a delivery, in this tournament. 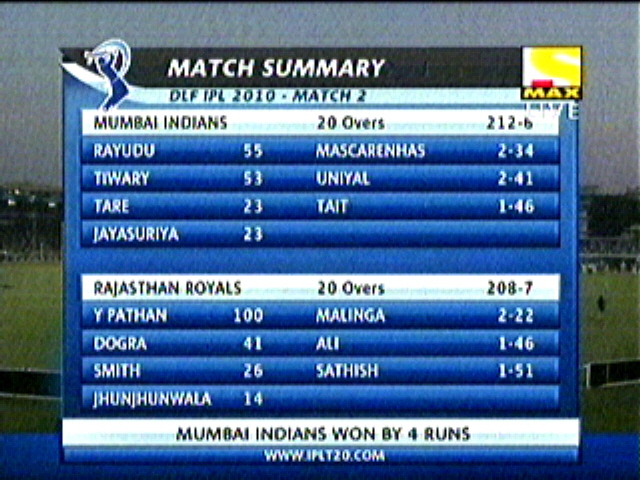 – This is third time, a team has won with 2 balls to spare, first two wins are attributed to KXIP. – Kallis became the 31st batsmen to be dismissed of the very first delivery (golden duck). – Hayden has scored 262 runs (about 53%) in the powerplay overs in 11 matches, (total aggregate till now is 486). – 29 balls betwen boundaries was the highest ever by CSK. This is their worst display. – Both CSK and RCB batted exactly 19.4 overs. None completed the quota of 20. – This is third game in a row, CSK has lost in Durban in the same ground in this season. – With 307 runs scored Sachin Tendulkar in the tournament becomes the highest run getter for Mumbai. – 16 wickets for Lasith Malinga,which makes him the joint highest wicket taker at this stage of the tournament. – Rob Quiney scored his Maiden IPL fifty. – Hayden has scored 262 runs (about 53%) in the power play overs in 11 matches, (total aggregate till now is 486).